In 1986, twenty people constructed and burned an 8 foot tall effigy of a man on a beach in San Francisco to celebrate the summer solstice in September. Admission was free. By 2011, the event, now called Burning Man, had migrated to a dry lake bed in northern Nevada, with more than 53,000 people in attendance, ticket prices up to $360, and ending with the burning of a wooden effigy 120 feet tall. Why would so many people come to a forsaken desert without accommodations and facilities and pay for the privilege? And is there anything particularly Jewish about Burning Man? For the past few years, there has been a noticeable Jewish presence at the festival, but not one that appears to be sponsored by the likes of UJA, Federation, or Hadassah. Counterculture-minded Jews, mostly with an artistic bent, have carved out some uniquely Jewish space, and filled it with their interpretations of Shabbat and Jewish life. On a Friday night in early September, more than 150 people gathered under a domelike open structure built in the desert to sing, pray, light candles and share in the traditions of the Sabbath. The open-air design, decorated with colorful scarves and an illuminated Star of David, is not the typical place you might imagine celebrating the Sabbath. In the middle of the Black Rock Desert in northern Nevada, more than 53,000 participants came to experience the 25th year of Burning Man, a counterculture city that comes to life for eight days each year. Based on 10 principles, including radical self-expression, self-reliance, leaving no trace and communal effort, Burning Man is the extreme sport of summer festivals. Facing dry, sizzling summer days, cold nights and 70-mile-an-hour dust storms, participants are pushed to their limits. At first glance it may look like an idyllic scene from a Disney fantasy, but the reality is far less sanitized. Starting at sunrise, but not ending at sunset, there is a constant flow of booze at themed bars scattered around the playa. For those who avail them, there are also substances to help people enjoy Burning Man from an altered state of mind. 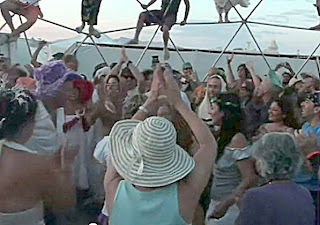 Refuge can easily be taken at one of the many themed camps at Burning Man. Sukkat Shalom, meaning “shelter of peace,” is a Jewish-themed camp that attracts about 80 people (Jews and non-Jews) who camp and take part in the community, sharing in the responsibilities of cooking and programming. While there are many camps at Burning Man, the majority of them are jocular and few are overtly religious. If any belief is mentioned, it is usually spirituality. The people who attended Sabbath services at Sukkat Shalom came from a wide variety of Jewish backgrounds. Though the lack of tznius, or modesty, probably limited the more Orthodox, observant Jews, all were welcomed in the space, including Israelis and even those without a Jewish upbringing. Some dressed in eye-catching costumes, others were scantily clad, while many donned yarmulkes and dressed in a more conservative style. WARNING: ADULT CONTENT. VIEWER DISCRETION ADVISED. So what? All this shows is that Jews (like anyone else) are open to new experiences and creative opportunities. I don't see any big deal here. Could've come straight from the Senate or House of Reps...a whole lot of talking, nothing much said, and absolutely NOTHING done. Maintaining your identity just helps to isolate yourself from the ones around you. To the 2 commenters here: If you have nothing constructive to say...do not say a thing and the world will be so much better! Also...stop hiding yourself behind "Anonymous".